Using project-based learning across the curriculum helps students make interesting connections. 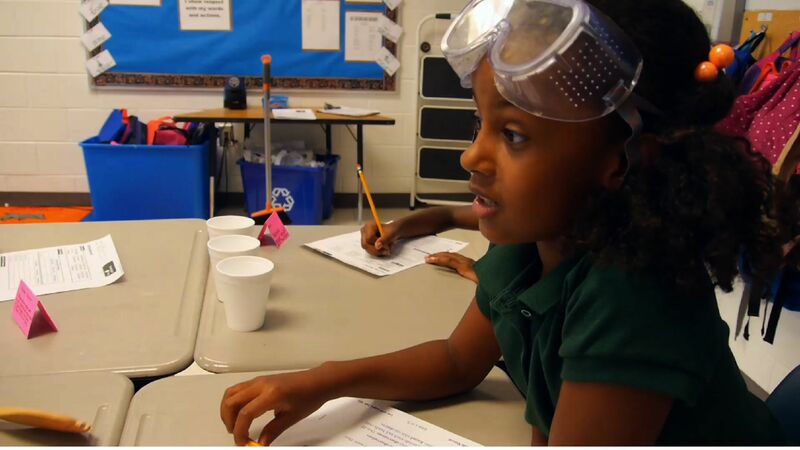 Charles R. Drew Charter School is a STEAM (science, technology, engineering, arts, and math) school, and project-based learning is their instructional delivery method. By integrating PBL and STEAM, they empower students to take ownership of their education. At Charles R. Drew, grade-level elementary teachers collaborate in planning each PBL unit to come up with one driving question across the grade level. Every grade level does four PBL units over the course of the year, one per nine-week quarter. When designing projects, Charles R. Drew follows the Buck Institute for Education's "Essential Project Design Elements Checklist" (PDF). The first step is to make sure that the project is aligned with standards and what your students need to know. Charles R. Drew teachers meet during the summer to start planning their unit. They look at Common Core Standards, the Georgia Performance Standards, how those standards are applicable in the real world, and how that's relevant to their students. They use this base knowledge to create the driving question that will guide student inquiry throughout the project. "A big standard in third grade is teaching about heat," says Abigail McCann, a Charles R. Drew third-grade teacher. Once they identify heat as a standard, they discuss other standards across the disciplines to see if they can be incorporated with heat. "We know that heat has to be measured, so we might incorporate mathematics with that," elaborates McCann. "Once we have our standards picked that we'd like to encompass in one project-based learning unit, we need to figure out a real-world application of these skills." A project is centered around a driving question, which is a relevant problem or question for students to solve. What informed Charles R. Drew's driving question? It addresses a real-world problem that relates to the students' experiences and community. It inspires students to find a solution that will have a long-lasting impact on their community. "We wanted to see if students could figure out a problem within their community that they could solve using heat. We immediately thought of the Snowpocalypse," recalls McCann. "It was a very big storm. It paralyzed all of Atlanta." During the Snowpocalypse, Atlanta’s biggest snowstorm last year, people were stranded at school, on the road, at stores, and at restaurants because of the snow. "We went in this direction because we knew that it affected a lot of their families; it affected our school," says Natasha Jenkins, a Charles R. Drew third-grade teacher. "I needed to find a way to present this problem to them so that they could then arrive at this decision that, 'Wow, I really want to do something about it' -- so they would feel a personal stake in this problem," recounts McCann. "I gathered community members who would be able to shed some light on what it was like to be in these situations that we read about." The third-grade students researched the Snowpocalypse. They read newspaper and online articles about the event. They interviewed community members who experienced it. They created Snowpocalypse narratives, not only summarizing what happened but also capturing the problems Atlantans' faced and how it made them feel. But what really impacted the students and made this project personal to them was bringing in community members who could share their own stories about the big snowstorm. The students heard from "a faculty member who was stuck in her car with her daughter for 18 hours on the road," says McCann. "A lot of the speakers mentioned that they either helped others through this process, or they could have used some more help, or they wish they could have helped. That word stuck in the minds of my students. And you could tell that they were thinking, 'I wish I could have helped!'" "Having the opportunity to interact with those community stakeholders in that way really inspired my students," observes McCann. "You could see it. They were excited. They were fired up. They couldn't believe some of the stuff they heard. It was wonderful because they could see that there was a problem. That, to me, was this very organic way that they arrived at this problem, and this feeling of, 'I want to do something about it.'" Through sustained inquiry across subjects, Charles R. Drew connects the inquiry process with presenting content about heat. "It's a way for students to understand the content, learn it, experience it, and then be able to apply it to this new situation," explains McCann. "For example, we might do an experiment about friction, because friction is one of the ways that we can create heat. I might have my students rub their hands together." Once her students understand friction, she uses a guiding question to connect that understanding to the problem they're trying to solve. For example, she may ask, "Can we use friction when we're thinking about how to better prepare Atlantans for weather like this?" This will lead her students to start problem solving. They may say, "I remember when Ms. O'Dunn spoke to us in our panel about how the homeless were really cold. I'm wondering if we can create mittens that create a lot of friction and better warm their hands?" Melissa Ford's third-grade students decided to create a safety kit that would help students stranded during the Snowpocalypse. They learned about heat conduction as they tested everyday materials to see which were the best heat conductors to include in their kits. They learned about insulation as they created solar ovens. Ford incorporated mini projects throughout the unit to connect their inquiry process with her presentation of content about heat. "As teachers, we're not completely sure what the end product will look like," admits McCann. The teachers design the project and create an outline for guiding their students in navigating that project, but it's ultimately the students who come up with solutions to solve the problem and create the product. From talking with her class, McCann knows that "the product is going to look like something that we can prepare ahead of time and give to people." What will that look like? It might be a kit that people keep in their cars or at school to use until they can get help. It may be mittens or helpful information given to homeless shelters. It may be a presentation for second-grade students about ways to prepare for the cold. These are some of the ideas that Charles R. Drew third-grade students came up with. "And part of the beauty of project-based learning," affirms McCann, "is that our students are going to play a very significant role in deciding exactly what that product is going to look like."